Located the northeastern corner of Botswana, Chobe National Park encompasses more than 4,500 square miles (12,000 square kilometers) of floodplains, forest, swamps, and rivers. The park is known for having one of the largest concentrations of wildlife in Africa; most notably, a large elephant population. 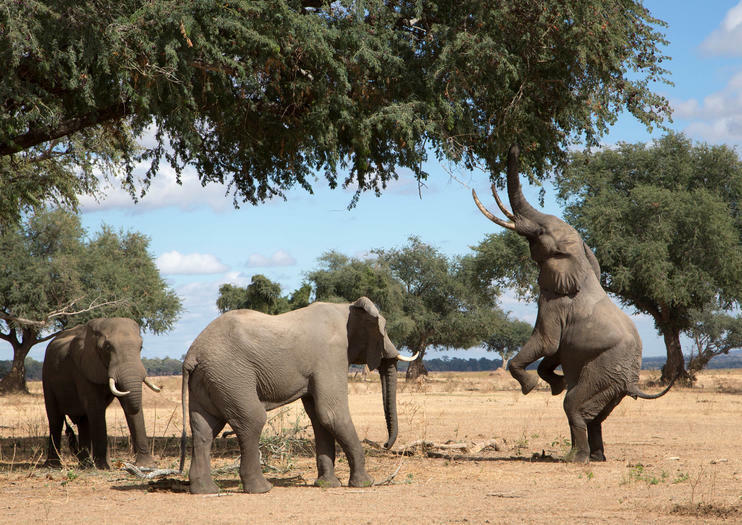 With a location near the borders of Zimbabwe, Zambia, and Namibia, Chobe is great for a daylong or multi-day tour from any of these neighboring countries. You can combine a Chobe day trip from Victoria Falls with a scenic drive through the adjoining Zambezi National Park. Popular activities include boat cruises along the Chobe River, a game drive through the wilderness areas, and lunch at the Chobe Safari Lodge. If you have some extra time, a camping safari will allow you experience Chobe at sunrise and sunset. If you’re short on time, take a safari from Kasane, which will often include a scenic river cruise. Wear comfortable shoes and layered clothing, and bring sunscreen, bug spray, and water. If you’re arriving from a neighboring country, be sure to bring your passport. Some safari vehicles and boats offer wheelchair access, but it’s best to check in advance. Chobe National Park stretches along the Zimbabwe border in northern Botswana, and the most convenient entry points are Victoria Falls in Zimbabwe and Livingstone in Zambia. From the falls, it’s about two hours by 4WD. Chobe National Park is open year round, but you’ll see the best wildlife in the dry season (May to October), when game viewing around the waterholes and riverbanks is at its best. For bird watching, come later in the season; most migratory birds arrive from August onwards. Visitors traveling in rainy season (November to April) will have the most luck spotting wildlife in the Ngwenzumba Pans, which fill with water and attract animals from across Chobe. Road closures are common during the wettest months. Chobe has at least four of Africa’s Big Five—elephant, lion, leopard, and cape buffalo—plus pachyderms, antelope (including the rare oribi antelope), hyenas, impalas, zebras, wildebeests, giraffes, and warthogs. It’s not uncommon to spot hippos and crocodiles by the rivers. The area is also home to more than 460 birds, including fish eagles, skimmers, spoonbills, egrets, kingfishers, and coppery-tailed coucal. Hvis du besøger Victoria Falls på en tidskrække, kan du stadig tage en safari med denne safari tur over natten. Få en kondenseret pakke af de bedste safaris har at tilbyde: se dyr i det vilde, kokken over en åben ild og sove under stjernerne. Plus, denne tur er altomfattende, så det kunne ikke være nemmere at gå. Oplev det sydafrikanske ikoniske dyreliv og landskaber på en 5-dages tur til Victoria Falls og Chobe National Park fra din valgte ankomst er Kasane eller Victoria Falls. Krydsture Zambezi-floden, tag en guidet vandretur ved siden af ​​?? faldet, så udforske området i dit eget tempo. Rejs til en safari lodge i hjertet af Chobe for at se de bemærkelsesværdige dyr i Botswana's første nationalpark; Chobe er hjemsted for omkring 50.000 elefanter, sammen med blomstrende populationer af zebraer, wildebeests og warthogs. En fremragende værdi for pengene, denne episke tur tager dig til tre lande-Sydafrika, Zimbabwe og Botswana. Besøg nationalparker og spil bevarer, tage byture, nyd en flod krydstogt, og se stort spil i det naturlige habitat. Indkvartering og en lokal guide er inkluderet i hele rejsen.